This is a short piece to introduce a new initiative – Progressive Southern Theologians – which seeks to bring together progressive theological writers, artists, activists, etc., who are living and working throughout “the South” – or the Southern region of the U.S.
We’ll share our reflections on faith, culture, and politics. We seek like-minded individuals who are also living and working and writing in the South to be in touch and join us in our endeavors. Primarily, we know that it can be isolating to be a progressive person of faith in the South, and we want to bring together a platform through which to share and to listen to and to learn from one another. We come from privileged and underprivileged backgrounds. We’re from different gender, racial, sexual, and religious expressions. And no, for the curious, we’re not laying down a rigid definition of the slippery word – “progressive” – other than that we share a commitment to work for the common flourishing of all people, and to work in whatever ways we can to change systems that work against that sacred value. You can read more about that here. Last week, the beloved Rev. Dr. Katie Geneva Cannon, born in Kannapolis, North Carolina, crossed gently into the eternal - joining a great chorus of ancestors and saints who sing and dance in the glory of the Sacred. Dr. Cannon was the Annie Scales Rogers Professor of Christian Ethics at Union Presbyterian Seminary, along with other several other roles and honors that she held and accomplished throughout her life. The idea to gather a collective of progressive theological voices from the South emerged just a few months before her passing, but it wouldn’t have come forth without her life and influence. “Do the work your soul must have,” counseled our beloved professor, mentor, brave leader, and friend. Dr. Cannon, for those who were never gifted to be in her presence, was so grounded in the power of her being that she was able to be open to all who crossed along her path. No, Dr. Cannon’s gracious and welcoming spirit was deeply rooted in a powerful sense of self that knew how to set boundaries and how to cultivate self-love and love of the people – especially in the face of forces that sought to undermine such love and self-esteem. Out of this solid faith in the sacred value of oneself and others, Dr. Cannon invited her students into a space that helped each person discern their calling and vocation. 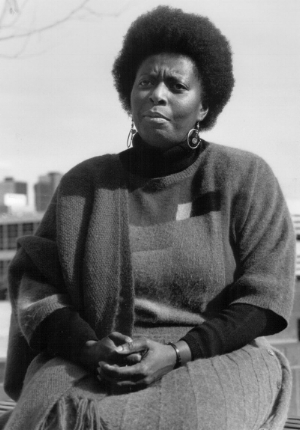 Her career, especially, was marked by moving the voices and wisdom of black women into the center of theological reflection and writing, particularly in an era where such voices had not been welcomed into white-dominated halls of theological academia. As she carried out her life’s work – at Temple, Harvard, Episcopal Divinity, and Union Presbyterian Seminary (along with other institutions) - she empowered students to believe that they could do any sacred work which spoke to their own passion and, just as importantly, that was for the ethical well-being of their community of accountability. In that sense, Dr. Cannon knew and taught us that our lives didn’t stop at the door of the academy. We brought not only our brains into the classroom, but our whole bodies, our racialized bodies, our sexual bodies, our gendered bodies, our differently-abled bodies, our wealthy or poor or athletic or tall or short or rotund or slim bodies. We brought our whole selves into the classroom – our feelings, our pains, our joys. Likewise, we brought our scholarly work into a world of art and color, smells and tastes, movement and stillness, ugliness and beauty. In this regard, Dr. Cannon's work has greatly impacted the way this author has structured his own learning environments and classrooms. Dr. Cannon constructed her syllabi and pedagogy in such a way that she created intentional space in which all voices could be heard. In all of my subsequent courses - whether graduate, undergraduate, or adult education - Dr. Cannon's influence was present as she taught me and others how to create a generative space that both instructed and gave room for individuals to grow in their own development and sense of self. On the first day of my classes, I pay tribute to this incredible teacher, acknowledging the creative inspiration behind my own syllabi, text selections, and assignments. Dr. Cannon also showed us how to look into ourselves and see the Divine, and how to look into the eyes and cultures and bodies of all others and see the spark of the divine that persists in them. She taught us to see that the energy of the Spirit can never be defeated or wiped away or completely snuffed out. She taught us to live with boldness and courage and wit and integrity. She taught us that when we failed or fell down, to remember our sacred worth and to keep trying. She taught us to take one step at a time and to keep moving toward the vocation to which we’ve been called. She taught us to embrace the frailty of our humanity and the sacredness of our time with our communities and our loved ones. She taught us to fight courageously for justice and goodness and beauty and truth – no matter who we are or what we’ve done or where we’ve been or from whence we’ve come. It’s from Dr. Cannon’s influence that this collective project emerges (i.e., Progressive Southern Theologians). It emerges from a call placed upon the soul of this author, though it’s my intent that this project primarily serves as a platform for others. We – a royal way of saying “I” - seek to bring into focus the work that other progressive people of faith are bravely doing in the South in response to the call of the Divine on their own lives and in their own communities. In other words, it’s the vision of this group to affirm and elevate the work of those progressive writers who catch glimpses of and travel along with the Divine in “the South” of the United States. This often means moving through a) geographically isolated communities, b) small towns with crumbling infrastructure, c) the re-emergence of segregating powers, d) counties and parishes where jobs vanish and have never returned, and e) communities where oppressive racial, sexual, and gender norms still hang densely over most daily interactions. Thus, to be a progressive theologian in the South – not to mention a progressive person in general - is, many times, to be on a lonely path. It’s also a path with a foggy past – where like minded people have certainly gone before, but their legacies are often quieted or forgotten. In other words, progressive people of various races, faith traditions, gender identities and expressions, sexual identities and expressions, etc., have bravely written, and spoken, and preached, and danced, and marched, and created before us. Just as many – we trust – will come after us. We did not begin the work, but the work is ours to continue through deep listening and activism and reflection and organizing and steadfastness. We hope – through this work – to continue keeping one another company on the journey. It will hopefully speak to others living in the South who feel the difficulty of traversing the arid (or, rather, the thickly humid) environment that does not often welcome the Stranger, or the immigrant, or the gender non-conforming, or the Muslim, or… the many “Others” that our shared Southern cultures insist on Other-ing. Whatever this project becomes as we continue in our writing and work, we hope others will read and be connected to the voices of those who contribute to a shared progressive vision. We don’t speak for everyone – we don’t speak for each other – and there will most certainly be countless others doing the work of whom we’re unaware or disconnected. Nevertheless, we must start somewhere. Whether that’s in Jackson, Mississippi, or throughout the Delta, or in Macon, Georgia, or the coastal plains of North Carolina, or the mountains of Tennessee, or the hills of Alabama, or the bustling metro area of Richmond, Virginia. Marc Boswell, Ph.D. is the director of Together for Hope Louisiana, a community development non-profit in the Louisiana Delta. He graduated from Union Presbyterian Seminary in 2009 with an M.Div., taking several courses under Dr. Cannon during this time. Dr. Cannon remained a mentor and friend as Marc worked toward the completion of his Ph.D. in Theology and Culture from Garrett-Evangelical Theological Seminary (Evanston, IL.) Marc later taught in the Theology and Ethics department at Union Presbyterian Seminary's Charlotte campus during the 2015-2016 academic year. He is forever indebted to her kindness and generosity.